The latest Consumer Expenditure Survey conducted by the U.S. Bureau of Labor and Statistics was published in September. 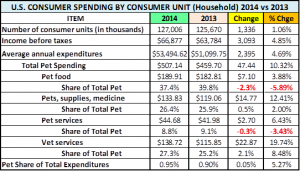 Pet Expenditures by the average Consumer Unit (Household) jumped from $459.70 in 2013 to $507.14 in 2014…a 10.3% increase…twice the rate of increase in total consumer expenditures, which was 4.7%. Let’s turn these “averages” into totals. It requires a special calculation because the data is gathered by 2 different methods but here’s what it looks like. While all segments are up, Supplies and especially Veterinary Services are the “drivers”! Pet Services and Food are not as far up as the other two, but both are radically better than they were at the mid-year update published in May. The second half of 2014 was exceptional for the entire industry. Also, remember there was no price drop in December in Food and Supplies…which helped. Let’s hope 2015 is as good or better! The Graph below should help you appreciate just how important the the second half of 2014 was for the Food and Supplies Segments and really the whole Industry…turning a good year into a great year! If we assume that 65% of U.S. households have a pet(s), then their average annual expenditure on Pets, Pet Products and Services is $780.22. Let’s put this spending into perspective. 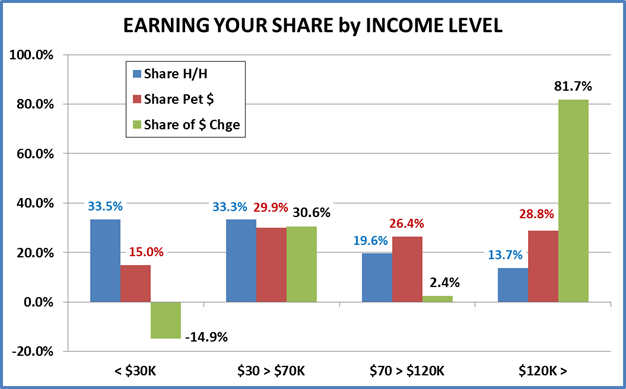 The vast majority of the growth in Pet $ is coming from the wealthiest households. 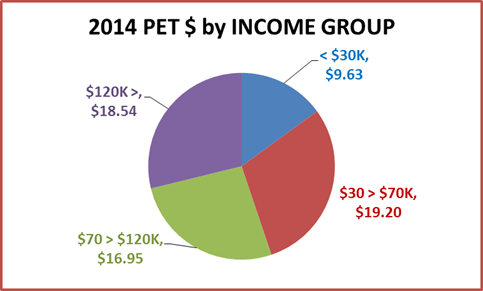 The H/H Pet Spending for $120K> is strongly increasing (+27%) and they are growing in numbers (+8%). It costs money to have a pet. The under $30K group is 1/3 of America but spends only 15% of total Pet $. This group is getting smaller as incomes rise but they are also “watching” their spending. Another 1/3 of America is the $30>$70K group. The $2B increase from this group is a bit of a surprise and merits a closer look. At this point the <$70K income group represents 67% of American households but spends only 44.8% of the Total Pet $. However, sales in the upper half ($30>$70K) of this group are growing… primarily by increasing H/H spending….not by a big increase in the number of H/H’s. 2014 was a great year for the Pet Industry. However, we have seen that it was a little greater for some households, especially those with higher incomes. Let’s now take a brief look at the Individual Segments of the industry to see what effect the consumer’s household income level has on purchases. For our review, we will divide the Industry into 2 groups – Products, which includes Pet Food and Supplies and Services, which includes Veterinary and A/O Pet Services. The specifics of the Total U.S. performance by Segment were included in charts on the first page. We will note the totals in a recap of each section below but the primary vehicle for comparison is the “share” chart that we used for the Total Industry. 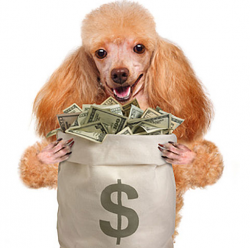 Pet Food 2014 – Total $24.1B; Up $1.1B (4.8%)…51% of the $ are done by under $70K H/H’s. Pet Food made a tremendous comeback in the second half of the year. The “rolling” 12 months sales were actually down -$100M through June 2014. The increase was driven by $120K AND the $30>$70K Group. The $120K> group had increases in spending and H/H’s. $30>$70K was due to increased H/H spending. The Under $30K group had an increase in Food spending per household but was driven down by a decrease in the number of households. The $70K to $120K had a significant increase in numbers but a big drop in household spending on Food. Since it is unlikely that there was a precipitous drop in the number of Pet Households, it is likely that this group began serious price shopping. 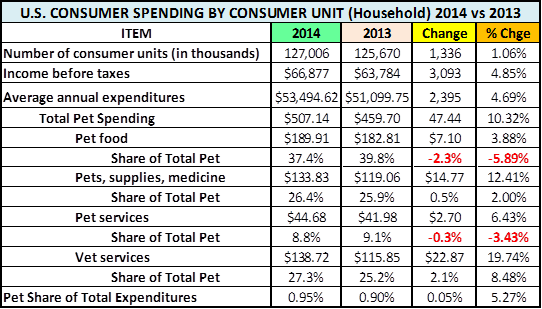 Pets & Supplies 2014 – Total $17B; Up $2.03B (13.6%)…44% of the $ are from under $70K H/H’s. Up 6.5% at midyear, prices moved up…but sales still accelerated in the second half. Many supplies are considered “discretionary” purchases. Even with price deflation during 2014, the growth was almost totally driven by income groups over $70K as most of America shopped for value or just said “no”. The Under $30K group had a slight increase but 84% of total supplies are done by over 30K H/H’s. Veterinary 2014 – Total $17.6B; Up $3.03B (20.8%)…40% by under $70K H/H’s. As you can see the over $120K H/H’s are the big driver as Veterinary Prices continue to increase at a high rate. Most other income groups appear to be choosing to defer, delay or seek other options in terms of traditional Veterinary Services. The one surprise is the $30>70K group. There must be other factors beyond income. Pet Services 2014 – Total $5.7B; Up $0.40B (7.6%)…Only 34% by under $70K H/H’s. Once again the over $120K H/H’s are truly driving what is a below average increase in the industry. Inflation may be becoming an issue. The $70K>$120K “middle class” is showing an increase. However, as with the Supply segment, the $30>$70K group is dialing back on spending on services…but still accounts for almost ¼ of the spending in this segment. $30K or less – Pet Spending down -$0.98B. This is driven by a large (-653K) drop in the number of H/H’s and a slight drop in H/H Pet spending to $237.82. H/H spending ever so slightly up for Food, Supplies and Services. The big drop came in H/H Vet Spending -32%, which drove the Veterinary Segment down -$1B. This income group is obviously price sensitive and the ever inflating Veterinary Prices are having an impact. $30K>$70K – Pet Spending up $2.02B. The increase in this segment is due to a 11.8% increase in H/H Pet spending to $447.78. There was also a 0.4% increase in the number of H/H’s (+147K). The increase in $ was not just across the board in every segment. They spent about -3% less per household on Supplies and Services which produced a drop of about -$0.13B. However, each H/H spent 8% more on food which generated a $0.6B increase. (The only other increase in Food spending came from the $120K> group.) The big dollars came from a 42% jump in H/H Veterinary spending producing $1.6B increase. This $30>$70K group is obviously conscious of their spending as the two somewhat discretionary segments were essentially flat but the “necessities” of Food and timely Veterinary care were up…a lot. This is a significant change for this income group. $70K>$120K – Pet Spending up $160M. 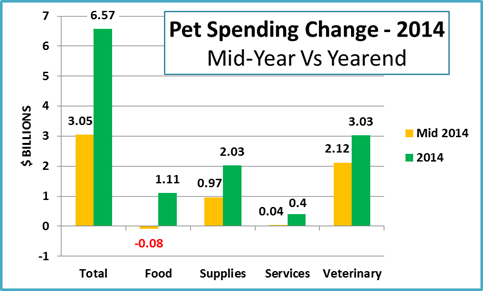 This segment is growing in numbers (+482K) but Pet H/H spending is down -4% to $651.85. Like the $30k>$70K segment, results are mixed…but exactly opposite. There is increased H/H spending on Supplies and Services while spending on Food and Veterinary are down. The biggest changes are in Veterinary, down -$0.64B and Supplies, up $0.87. The changes in the other segments are slight. Food is down -$0.13B and Services are up only $0.06B. With income above the National average of $67K, this group has always been a prime focus for our industry so the relative lack of performance is a concern. When you look at the income ranges within this group, you see that the drops in spending in Veterinary and Food occur across all income values. We have noted that most Americans have become more value conscious. It appears that a certain percentage of this group started “shopping around” or delayed some services. 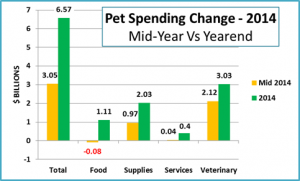 $120K> – Pet Spending up $5.37B. What can you say? This is the fastest growing segment in number of households (+1.332K). The total H/H increase for the country was (+1,336K) so the net increase for all groups below $120K was (+4). Combine that with a 27% increase in Pet H/H spending to $1067.08 and you get a fairy tale. All segments are up. Veterinary and Supplies have the biggest increases with $3.1B and $1.2B respectively. Although Food at +$0.71B and Services at +$0.35B are also the biggest increases for any income group. Currently, this is the biggest opportunity in the industry. They shop at a variety of retail channels…Pet Specialty, Clubs, even Value Stores but also remember… that 94.5% of them have high speed internet service! Up $6.6B! The “Headline” news for the industry is spectacularly good. However, as usual when you start looking at the details you find pluses and minuses. That’s not bad. Even the negatives are usually opportunities that, if properly handled, can generate unanticipated growth. Well, that seems to make the performance of the $30K>$70K group a little clearer, but what action should be taken? Aging causes changes. Money becomes a concern and formerly easy tasks become harder…but you don’t want to give up the things that make life worthwhile…like your pets. Retailers and service providers could offer a Senior Discount…say 10% off for age 65 and older. This should be affordable and definitely make it easier for Senior Pet Parents, a fast growing demographic, to continue the benefits of having Pets. One last bit of info….The 25>34 age group has an average income of $61K and their Pet Spending is up $1.5B! It turns out that the Pet spending in the $30K>$70K is being driven by both ends of the Age Spectrum. It reinforces that Pets are a lifetime commitment and bodes well for the industry! As promised, a 2 page detailed Appendix on Pet Spending by Income Group is available through the link below. Just click on the button to download and save the file as a PDF. If you would like this in Excel format, send me an e-mail request.